Some like it spicy and some like it hot. That’s the theme for this week’s Sunday Supper. Oh did it ever make me smile as soon as I saw it. Immediately I anticipated a big lineup of spicy food in varying degrees of heat. And oh do I love spicy food. Love it. Whittling down what I would make was quite a task. Finally I decided to go with Baked Sriracha Sweet Potato Fries. Sriracha is always in my pantry. I have both sauce and seasoning. A little dab or sprinkle can give a spicy touch. For example, a small drizzle of the sauce on a Caesar salad adds a little kick to the ordinary. It sounds strange, I know. Just give it a try and see for yourself. Note to self to do a recipe for sriracha Caesar dressing. Sriracha seasoning has become my favorite savory spice. I’ve used it for Sriracha Herb Roast, Spicy Candied Pepitas, and Sriracha Spiced Peanuts. The sweet/hot combo is what made me think of sweet potatoes. I wanted to avoid frying or deep frying so I went with baking them. 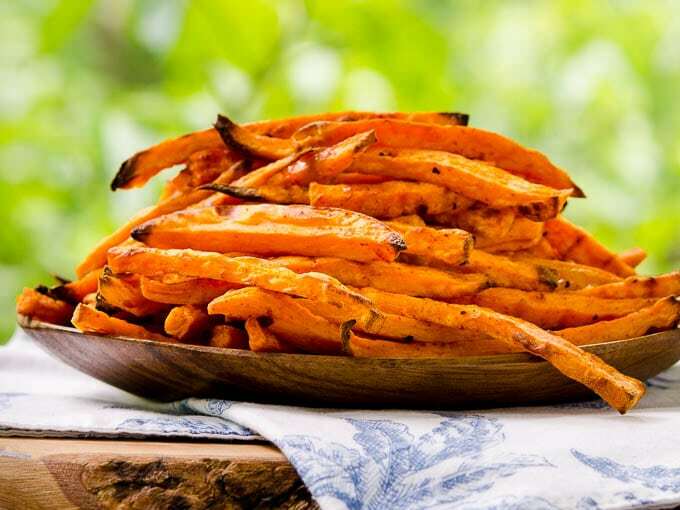 How are Baked Sriracha Sweet Potato Fries? They have a softer texture than typical fries. It is more like roasted potato strips which is fine by me. I read somewhere they will be crispier if you coat them with cornstarch after cutting the strips. That method wasn’t tested on these however I did note it in the recipe instructions. The fries have a spot on balance of sweet and hot. The level of heat depends on how much seasoning you use. One teaspoon for spicy, two teaspoons for hot, and beyond that is lip numbing. Make sure there is space between the fries on the racks. You want air to get on all sides so they cook evenly. The only thing you have to do is switch the position of the baking sheets every 10 minutes. It’s so one pan isn’t done more than the other. Do you enjoy spicy food? If so, scroll down to see the list of recipes. I plan to check out every single one of them. It is a mighty tasty collection of recipes by Sunday Supper tastemakers. Big thanks to Sarah of The Chef Next Door for hosting this wonderful event. 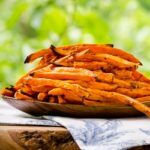 Baked Sriracha Sweet Potato Fries have tasty sweet/hot combination. They are fries for spicy food fanatics and anyone wanting to kick up the ordinary. Position oven racks to leave about 4 inches between them. Preheat oven to 425°F. Place wire racks inside rimmed baking sheet pans (half sheet pans). 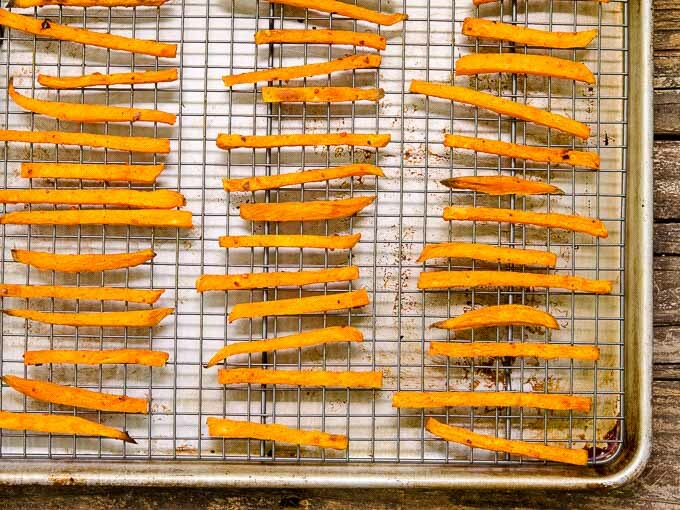 Peel and cut sweet potatoes into even sticks about 1/4-inch thickness. Lay a sheet of aluminmum foil on work surface. Place cut sweet potatoes on foil. Drizzle potatoes with oil and sriracha seasoning. Toss to coat evenly. Transfer coated sweet potatoes onto the wire racks leaving at least 1/4-inch space between them. Discard foil. Bake for 10 minutes then rotate pans (switch them between racks). Continue baking for about 20 minutes and rotating pans every 10 minutes until potatoes are dark brown on the edges and cooked through. These fries have a similar texture to roasted potatoes (soft on the inside and only slighly crisp on the outside). For crispier fries, toss them with cornstarch and shake off excess before tossing fries with oil and seasoning. I LOVE how you baked these fries. lol I will be just as OCD and try this next time I make baked sweet potato fries too! Love them with the sriracha! 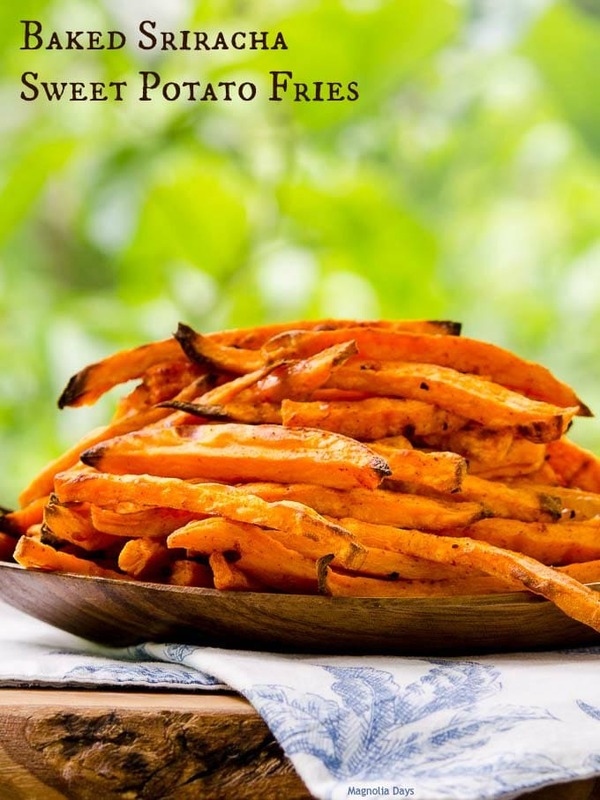 Sweet potato fries and me have been buddies for a long time. I made them for my sister in law once, and she had no idea what they were. Can you imagine what she’s been missing. I sprinkle mine with cayenne. I think we’re both on the same page here. Sriracha seasoning??? I had no idea they made such a thing. I must go find it now. I’m going to look for sriracha seasoning—these fries look fabulous, Renee! 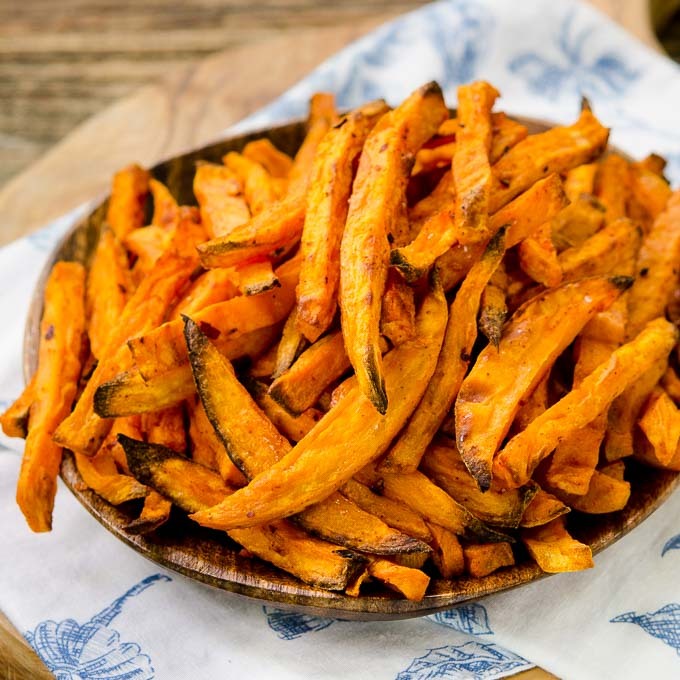 I have yet to be able to make any sweet potato fry crisp! However I have the same opinion as you….I don’t care! Love that you added a kick to these Renee! I’m with you – siracha is a favorite. These look amazing! Thanke for the tip on the rack – that is genius!!!! I love the pan/rack that you use for the fries- I made homemade fries a lot and they get overbrowned on the bottom- need to get on of those! I like the unique spin on regular old sweet pot. fries too! Genius about the baking rack! I can’t wait to try it. I hate flipping fries half way through so this makes it much easier for me. Looks absolutely delicious too!